I importuned Stephen Barnard for three photos that I saw on his Facebook page, and he reluctantly but kindly complied. His notes are indented. Be sure to send me your good photos of wildlife, astronomical phenomena, or even landscapes, as the tank is draining (there’s still a decent backlog, though). I have a note that I have photos sent by Mark Ayling, but I can’t find them, so if you are Mark, please resend. I wouldn’t normally send these photos because they aren’t up to my standards as photos, but you asked and I oblige. The first is a mink in poor light and at quite a distance, but it’s an action shot. One rarely even sees a mink, so that’s something. The second photo (again, poor light and far away) is one of a family of three river otters that were working their way upstream. This entry was written by whyevolutionistrue and posted on February 1, 2019 at 7:50 am and filed under mammals, photography. Bookmark the permalink. Follow any comments here with the RSS feed for this post. Both comments and trackbacks are currently closed. The creek never freezes over. Otters, herons, eagles, and other fish eaters can do well all winter. I think you are right, the minks in the UK are the American mink (Neovison vison) escaped from fur farms. The European mink (Mustela lutreola) did not live in what is now the British isles after the last Ice age. They may have been living there before though, I’m not sure. Note that the European mink is more closely related to mustelids like the pole-cat than to the American mink. However, they both have an ‘otter-like’ lifestyle. A minor case convergent evolution? Well, the info in Wikipedia may not always be detailed, but it is rarely wrong. I didn’t know that about polecats and European mink inter breeding. Are their descendants fertile? Do they actually interbreed in nature? In other words, are European mink and polecats ‘good’ species? At my earlier home in Iowa I found those two animals the hardest to get any photos worth a look. 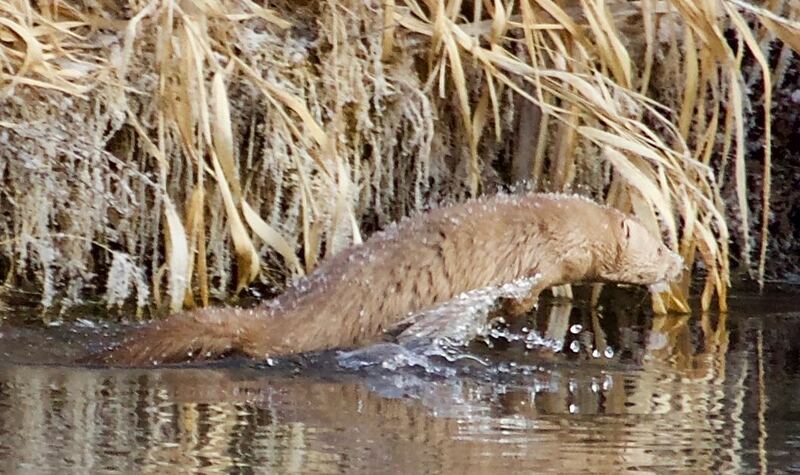 The mink comes out so seldom and moves very fast. The otters are around one minute and then gone. Good finds! Perhaps if there is ever a pair of otters with a pup they will stick around in one area for you to photograph. I’ve been on the lookout for a den, but no luck so far. It would be in a secluded place because the redneck fishermen around here don’t appreciate otters. They can really clean out a pond or a section of creek and seem to target the bigger fish. I’m a fisherman, and I have an intense interest in having lots of trout, but to me the mere presence of otters testifies to the health of the system. 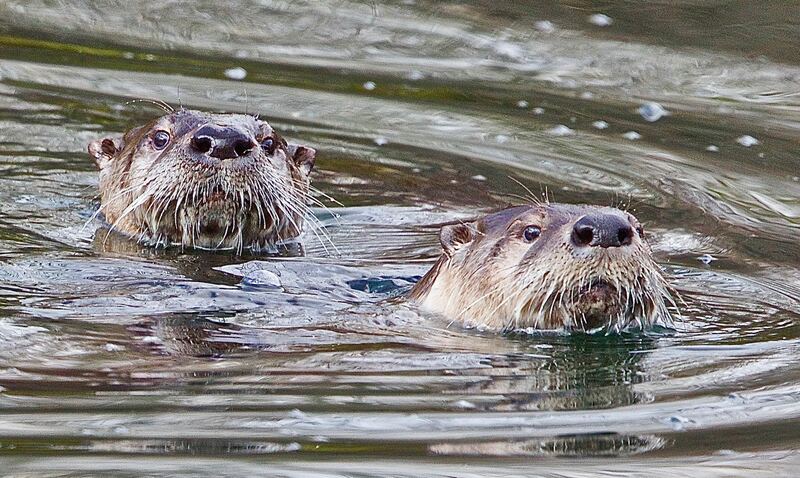 When I lived up in the mountains on the Salmon River I used to see otters while fishing. Once I heard a bird call I didn’t recognize, looked up, and saw a family of otters, including some young pups. The “bird call” was actually an otter call. Another time an otter surfaced right in front of me, unaware of my presence because I was behind a rock. For a fraction of a second we were face-to-face in touching distance. If those great photos are not “up to standard”, I really would like to see some you do consider up to standard! I love these photos, Stephen! Thanks. Nice documentation of that mink. I wonder how thick their hair is compared to otters (the hairiest mammal I recently learned here on WEIT). But maybe that’s just otters in the ocean, not river otters. Do minks also hunt fish? If so, they’re probably hunting for smaller fish than otters do. Hopefully both these mammals are banned from hunting/trapping in Idaho.